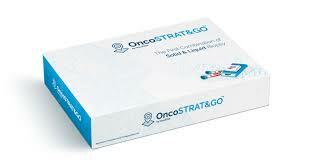 Is OncoSTRAT&GO the right test right for you? This test is about helping you and your clinician determine the best treatment plan for you based on the analysis of your tumour and blood. It looks for the presence of specific biomarkers and can identify how your cancer is likely to respond to classic chemotherapies as well as other targeted therapies and immunotherapies. It is relevant if you have Stage IV in Breast HR+ /HR2+, Colon, Prostate, NSCLC (Non-Small Cell Lung Cancer) or CUP (Cancer of Unknown Primary). For other cancers, see our OncoDEEP test – Click here. OncoSTRAT&GO results cover all therapies with potential clinical benefit – possibly including those which have not been considered for you before. This test is an analysis of your tumour tissue and blood. You will have had a biopsy and blood tests before you received your cancer diagnosis, and we can use the samples taken at that time so you do not need an additional medical procedure to take this test. You will receive an email asking you to confirm that you have authorised Everything Genetic Ltd to be given a sample of your tumour tissue/blood. Your samples will be analysed and a report will be generated, usually within seven working days of their receipt in the laboratory.